Can decibel power drown reasoning? Political expediency is understandable but should not attain proportions tantamount to obliterating history. The Supreme Court has pronounced its judgment, with four learned judges favouring the entry of women irrespective of age into the Sabarimala temple and one learned judge dissenting. The judgments speak for themselves and have all the characteristics of a scholarly debate. Let us focus here on the majority judgments. C) It violates fundamental rights under Article 25, under which right to profess and propagate religion is the freedom of every citizen. 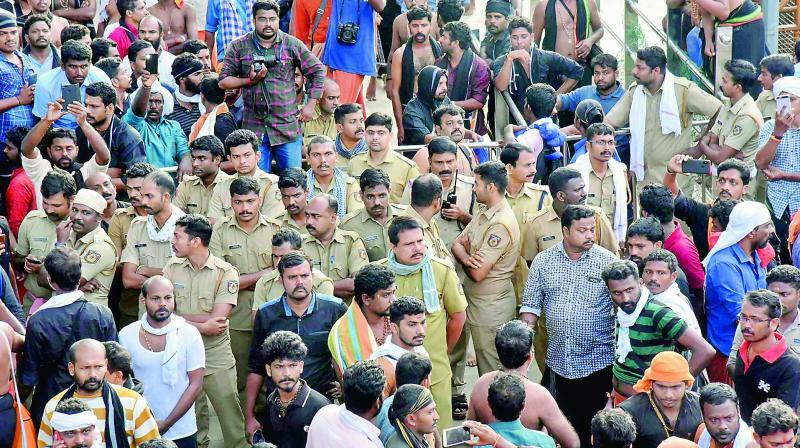 The court also held that devotees of Lord Ayyappa do not form a denomination to be covered under Article 26 of the Constitution. The judgment is unequivocal and has been delivered after considering all legal and customary practices. But expediency in the political and communal domain has resulted in certain groups taking to the streets against the State government, which is bound to implement the judgment. There have been instances in the past, when Parliament enacted laws with retrospective effect to nullify the impact of court judgments, including those delivered by the apex court. The Vodafone case is a classic example. But there is a fundamental difference here. In the instant case, it is not only a lacuna in the statute that has been pointed out but also the rule has been held to be violative of Fundamental Rights enshrined in the Constitution. Can the State legislate to override the verdict? The answer seems, No. Even if Rajya Sabha enacts a law on this subject on the State List (for which it is empowered provided there is a two-third majority), will it stand the test of judicial review? If a Constitution amendment is attempted, won’t it be affected by the basic structure doctrine of Keshavananda Bharati and the restrictions on amending power held in the Minerva Mills case? The strident cry for an ordinance or legislation is apparently playing to the gallery and even the protagonists do not seem to be convinced about it. Opponents of the State government, namely, the Congress and the BJP, are main rivals at the national level. Strangely, they seem to be on the same page in the agitation on the Sabarimala issue. Chief Minister Pinarayi Vijayan has taken the stand that the Supreme Court judgment will be implemented and the State does not plan to file any review petition. The orthodoxy represented by the priests and the erstwhile royal family of Pandalam (in whose household Lord Ayyappa was brought up according to legends) have resented his stand. This is nothing unusual. Even during agitations for entry into temples and nearby roads by persons not belonging to the then privileged castes, there was a high level of resistance. It is often heard that Mahatma Gandhi was denied entry into the Indamthurithi mana (of Namboodiri Brahmins) when he wanted to discuss the temple and road entry for all castes. Agitators for such rights in other places were rough-handled. Today, such untouchability has become an offence under the law. Those who argue for uninterrupted sway of traditions need to realise that changes have been brought in every religion and no religion is now as it was two centuries ago. But changes have not destroyed religions. Coming to Kerala, it would not be an exaggeration to state that many of the depressed classes remained within the fold of Hinduism after their disabilities in religious and secular realms were done away with by laws, including the Temple Entry Proclamation of 1936. Renaissance movements here and elsewhere have fought against decadent practices and sustained religions and not destroyed them. Political expediency is understandable but should not attain proportions tantamount to obliterating history. If somebody else worships a God which one worships, the devotion does not diminish. It is non-rivalled. Before closing, it would be worthwhile to mention that in the book “Native Life in Travancore” by Samuel Mateer, a Christian missionary in 1883, there is a discussion about Talanani, who belonged to the Mala Arayan tribe and was the “oracle revealer of the hunting deity, Ayappan, whose chief shrine is in Savarimala, a hill in Travancore Ghats”. There needs to be an objective historical research to find whether the Brahminical way of worship was a later origin in the religious place where hill tribes had specific rights. The differences Sabarimala has with other temples could be an evolution of this. Why talk about tradition as the reason for restricting women in a place of worship which has had no taboo for caste or religion? Are we trying to shake the egalitarian foundations of this place of worship by upholding later hierarchical distortions for expediency in the political domain? reasoning. Can decibels sans logic be allowed to drown this is the question facing the civil society comprising a large number of believers and lesser number of nonbelievers.